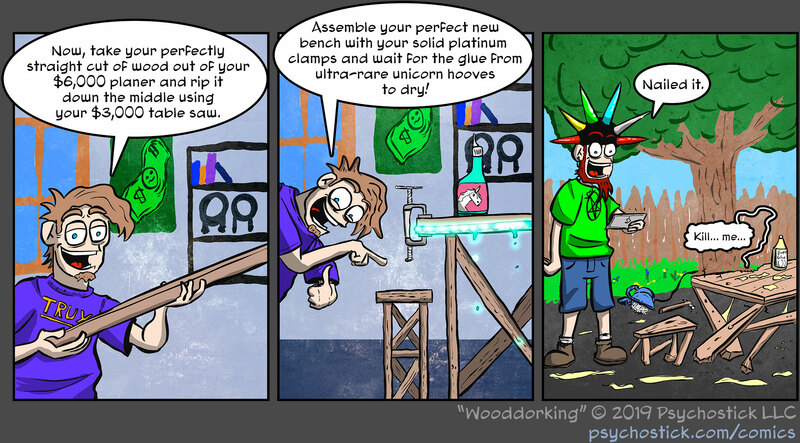 As I mentioned last comic, I've been super into woodworking lately. As the joke entails, watching those woodworking videos on YouTube are definitely helpful, but man do they have the fancy shiny tools I wish I had. Wood. Tools. "Talkin' 'bout weiners?" Anyway. So I've been doing WAY more art streams lately. If you're so inclined/naked, please join me when I'm live and I'll do you up a custom sketch!